After all the sweet stuff the last week or so, it was a bit of a relief to check the calendar and see that today is both Chili Day and Cook a Sweet Potato Day (hey, I don’t name these things; I just cook ’em). I love sweet potatoes, in almost any form, so I was happy to see this day on the calendar. 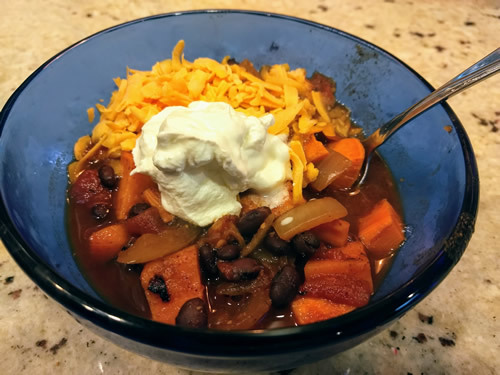 Plus, chili is a delightfully versatile vehicle for a whole lot of different things, so I knew it wasn’t going to be hard to find a good recipe that combined the two. Luckily I found this recipe, which combines sweet potato and black beans into something that sounded delightful. You start off by chopping up an onion and a sweet potato and throwing them into a pan to cook. Next you stir in some garlic, and a bunch of spices. The recipe calls for 2 tablespoons of chili powder, which sounds like a lot, except that you have to remember that sweet potato is, well, sweet, and the extra spice is necessary to help keep that sweetness from overpowering the rest of the dish. Next you add some water and let everything simmer until the sweet potato chunks are cooked through, and finally you add in a can of diced tomatoes and a couple cans of black beans, heat that up, and then serve. With a dollop of sour cream and a sprinkling of cheese on top, this was a delicious, homey bowl of goodness, which is something I really needed on a day like today when I’m battling a winter cold (ugh). We’ll definitely be making this one again, especially since all the ingredients are pantry staples.